Randy Brogdon was the only Republican challenger to Mary Fallin’s nomination for Governor in 2014. That has now changed. Brogdon sent an email to backers of his campaign yesterday announcing his intent to drop outo the the governor’s race to seek the Senate seat being vacated by current Senator Tom Coburn. In this letter, he writes about the dilemma he faced in making the decision to switch gears at this point in the race. He had been hesitant to go to Washington, but after considering it and talking to many people, he felt that he could do more for the cause of liberty if he were in Washington. With Randy’s departure from the governor’s race, we are left with only three candidates. Incumbent Republican Mary Fallin, Democratic Joe Dorman, and Independent Richard Prawdzienski. Of the three left, only Richard has been actively engaged in changing Oklahoma’s harsh ballot access laws. Oklahoma has its first Independent candidate for Governor for the 2014 election. Yesterday, Richard Prawdzienski announced his intent to run for governor. 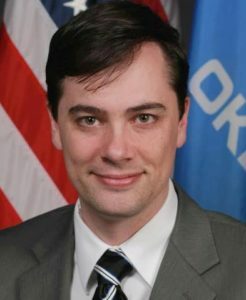 Richard is a former chair of the Oklahoma Libertarian Party and has been active member of the effort to reform Oklahoma’s ballot access laws. He has been a candidate for office before, in 2010 as an Independent candidate for Lt. Governor and in 2012 as an Independent for the State Senate seat for Edmond. Along with his campaign for Governor, Richard is looking for others to run along side him this year. Richard Prawdzienski, a former OKLP Chair, recently announced he will file for Governor and is building a Liberty Caucus of Republicans, Democrats and Independents to file for their Senate or House District. Oklahoma has not had an Independent candidate for Governor since 2002. In that race, Gary Richardson ran as an Independent and earned 14.1% of the vote. We welcome a full slate of candidates in the governor election this year. We are confident that Richard will make ballot access reform a priority in his campaign as well as his term in office if he wins the election. Recently, we wrote about how Speaker Shannon wanted to make Judicial reform a top priority in the coming session. Thanks to some help from members of both the House and Senate, nearly every one of his proposals has been put on the table. Let’s start with the constitutional amendments. Senator Shortey introduced SJR30 in the previous session and it has carried forward to the current session. This proposal, if accepted by the vote of the people, would limit judges to 12 years on the bench. After serving the equivalent of two terms, they will be required to resign. This amendment is not needed as the Constitution already provides means, though the retention ballot, for citizens to remove judges they feel are not performing their duties. From the House, Representative Osborn has introduced HJR1094. This constitutional amendment, if accepted by a vote of the people, would require judges to get a vote of more than 60% to retain their seat rather than the current 50%. Considering that no retained judges have received less than 60% of the yes vote since 2004, this might not have any real impact in elections. The next two bills change what information voters will have when considering judicial retentions. We really don’t see any reason why any on that additional information is relevant to the retention ballot. All that information is freely available to voters who wish to seek it out. What this will do is bias the votes against older judges appointed under Governors they did not support. The final bill, SB1748, is introduced by Senator Sykes. This bill if passed would change our current non-partisan district judge elections to partisan elections. It does not appear to create partisan elections for the State Supreme Court or the Court of Criminal Appeals. However, this change would do nothing but politicize something that should not be made political. Overall, none of this legislation improves the political landscape for judges. Of the four, only HJR1094 would be a net-neutral with the three others having a potential negative impact on the judicial system. RJ Harris was the first candidate for Governor to challenge Mary Fallin and seek the nomination of the Democratic party. He came in strong with a number of views on ballot access reform and election freedom that we liked. Unfortunately, he has decided to drop out of the race. Instead, he has decided to endorse Representative Joe Dorman for Governor. We’ve got a candidate here in Joe that, even if we don’t see eye-to-eye on every issue, if I wasn’t convinced that he wasn’t serious about taking some of these issues head-on then I wouldn’t be doing this. This leaves only three people left in the governor race, Incumbent Mary Fallin, Republican challenger Randy Brogdon, and Democratic challenger Joe Dorman. Of the three, Brogdon has the strongest history as friendly to ballot access reform, having authored strong ballot access reform legislation. Representative Joe Dorman has voted in favor of every ballot access reform bill to come to a vote. Last week we reported that Tracey J Williamson was making a run for governor. At the time, we expressed concern about her party status as it it was unclear which party she was registered under and for how long has been a member. Oklahoma Statute requires that you be a registered member of the party you wish to run under for at least six months before the filing period. This past weekend, Tracey has dropped her intent to run upon learning of this requirement. This is going to put an end to anything I was trying to do here. When I resigned my affiliation from the Republican party, I did not register with any party. This being the case my hands are tied. We can only hope that a viable candidate will appear that we can trust and get behind. We are sad to see her leave the race this early. We love to have as many people as possible join the race, especially if they support positive changes to Oklahoma’s election laws. We have another contender for the office of Governor. Since October of last year we have had 4 people, including incumbent Mary Fallin, join the race for Oklahoma’s next Governor. We now have a fifth candidate. Can an ordinary citizen run for governor ? Why shouldn’t they ? The slick politicians and lawyers are not leading Oklahoma in a positive direction. It is very clear they are self serving and only seeking re-election or other political goals by pandering to special interests. We need a positive change and perhaps that should come from one of us, not one of them. Until we see a viable candidate that is not a business as usual , typical politician, I will seek that position. In a video update, Tracey explains her political affiliation. She has been a registered Republican but considers herself a Libertarian. She explains that she intends to run as a Democrat. However, it was not immediately clear on whether she is currently registered as a Democrat. Oklahoma Statute requires that anyone seeking office be a registered member of the party they wish to run under for at least six months prior to the filing period. So, if she is not a registered Democrat as of the first week of October, she would ineligible to run as a Democrat. We have asked for clarification on this matter. I am for ballot reform, absolutely. Everyone should have a candidate they feel represents their thinking. It should not be that hard to make this a reality. We welcome any challenger that would make Ballot Access Reform an issue in the 2014 election and look forward to watching Tracey’s bid the for the governor seat. As we gain more information, we will let you know. The governor’race is really starting to pick up steam in Oklahoma. So far we have had Mary Fallin (R), RJ Harris (D) and Joe Dorman (D) announce their campaigns. However, new candidates have not stopped announcing their intent. Over Christmas, Randy Brogdon, former State Senator and primary challenger for the Republican nomination for Governor in 2010, has announced his plans to run for governor against Mary Fallin again in 2014. His announcement comes under the ideals that government has gotten too big and violates our liberties. At this time it is unclear how that translates to electoral freedom, particularly that of ballot access reform. There were no Ballot Access Reform bills put to a vote while Brogdon was in the State Senate and thus no vote history for him. He does not currently have any position statements on his campaign site. Yet, if he wants to be consistent with the idea that government regulates too much and wants to restore liberty to the people, then he should support ballot access reform. After further research on the topic of Brogdon’s position on Ballot Access Reform, I found some evidence that I overlooked. While no ballot access bills came to a vote while Brogdon was in office, he did sponsor a bill, SB 28, in 2007 that would have reduced the current 5% requirement to a flat 5,000 signatures to form a new party. The bill also reduced the current 10% vote test for party retention to 1%. Additionally, Brogdon was the Senate author of HB1072 in 2009. This bill was considerably weaker than his 2007 bill as it only reduced the number of signatures need to 3% of the last Gubernatorial election and left untouched the 10% vote test. The sponsorship of the strong reform bill, SB28, even though it did not get a vote in either house, puts Brogdon up as a top candidate for ballot access reform. We have contacted his campaign about this issue and will post again if we get a response. Yesterday, Representative Joe Dorman, Democrat District 65, announced his plans to run for governor against current Democratic Challenger RJ Harris and incumbent Governor Mary Fallin. Rep. Dorman is best known lately for his efforts to help get a ballot initiative in front of voters which would create a fund for the installation of storm shelters in public schools. Rep. Dorman is also term limited at the end of this session. We have reached out to Rep. Dorman about his views on ballot access reform and are awaiting his response. However we have look at his voting history on a couple of past bills. In 2009, HB 1072 reached the House Floor for a vote. While the bill was introduced to revert the state back to that 5,000 signature requirement, the House received an amended bill that simply struck the Presidential races from the 5% calculations. Rep. Dorman voted in favor of this modified bill. In 2011, HB1058 reached the house Floor for a vote as well. This bill was also amended from its original language calling for a 5,000 signature threshold to a 22,500 signature threshold. This bill would have greatly improved Oklahoma’s strict ballot access regulations. Rep. Dorman also voted in favor of this modified bill. Based on these two votes, it would not be hard to say that he would support HB2134 or SB668 if either one were to come to a vote in the 2014 Legislative Session. If neither HB2134 nor SB 668 come to a vote this year, the question becomes, would he support such a bill if it came across his desk as Governor? Would he passively support such a bill or would he be instrumental in getting it passed? We will keep you advised of his comments on this topic.